Detroit Bankruptcy Exit Plan Excludes African American Majority. 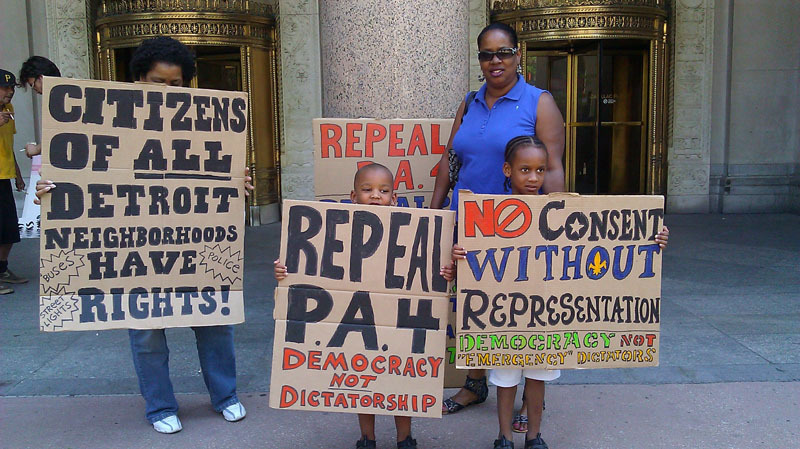 As the corporate-controlled media in the city of Detroit continues to champion the massive theft of healthcare programs, pension funds and public assets, totaling over $6 billion, the majority African American population is being completely disenfranchised by the bank-led so-called “plan of adjustment.” ~ Abayomi Azikiwe, Editor, Pan-African News Wire. Despite these claims of a “rebirth” of the municipality through a forced and illegal bankruptcy proceeding, the overall conditions within Detroit have declined over the last twenty months since the appointment of Kevyn Orr as emergency manager. Deliveries of public transportation, lighting, water resources, education and emergency medical services have worsened. There are two select areas within the city which the ruling class interests have lauded as prime centers for investment. In downtown, billionaires Dan Gilbert of Quicken Loans and Mike Illitch, the owner of the Detroit Tigers, Detroit Red Wings, and other corporations, are attempting to reshape the development agenda for the entire municipality. Also in the Midtown district encompassing Wayne State University, the Detroit Medical Center, the Institute of Arts, etc., efforts have been underway to encourage people to move into these areas for both residential and business purposes. Nonetheless, the working class, poor and senior residents of Midtown are being targeted for removal through the astronomical raising of rents and law-enforcement sweeps that target street people and the economically disadvantaged. There is an increasing demand for rental units in Detroit but this has more to do with the impact of the foreclosure crisis which has plagued the city for nearly a decade. Whole neighborhoods throughout the east, west and southwest districts of the city have been devastated due to the predatory actions of banks, insurance firms, the monopoly utility company DTE Energy and the deeply distressed Detroit Water &amp; Sewerage Department (DWSD). The state and local governments failed to place a moratorium on bank foreclosures which could have saved tens of thousands of households from the bank seizures of their properties and therefore stem the precipitous decline in tax revenues and public school enrolments. Massive electrical, heating and water services shut-offs also serve to drive people from neighborhoods since it is almost impossible to live in homes without these essential necessities of modern life. Two major efforts were made through the legal and political actions of the Moratorium NOW! Coalition and other organizations to bring in the questions of predatory bank lending and water shut-offs into the considerations for how the plan of adjustment would be structured. During the bankruptcy trial, there were hundreds of rank-and-file workers, retirees and homeowners who filed legal objections to both the eligibility for municipal bankruptcy as well as the series of eight drafts of the plan of adjustment. Jones Day law firm, which misrepresented the interests of the city through the emergency manager and Gov. Rick Snyder, rejected any mention of the role of foreclosures and evictions in relationship to the financial ruin of Detroit. To ignore such an obvious fact of history and its causative effect on the decline of the population, the destructions of housing stock and municipal services is a clear recipe for disaster in formulating a plan for the revitalization of the city. The class action lawsuit filed by victims of the massive water shut-offs impacting over 30,000 households since Jan. 2014 sought to bring recognition of the broken DWSD system which has been strangled by usurious bond issues and loans that have drained at least $537 million from the city over the last two years. Nonetheless, Federal Judge Steven Rhodes refused to impose a moratorium on the termination of water services despite the fact that the effects of these policies negatively impacted people throughout the city. 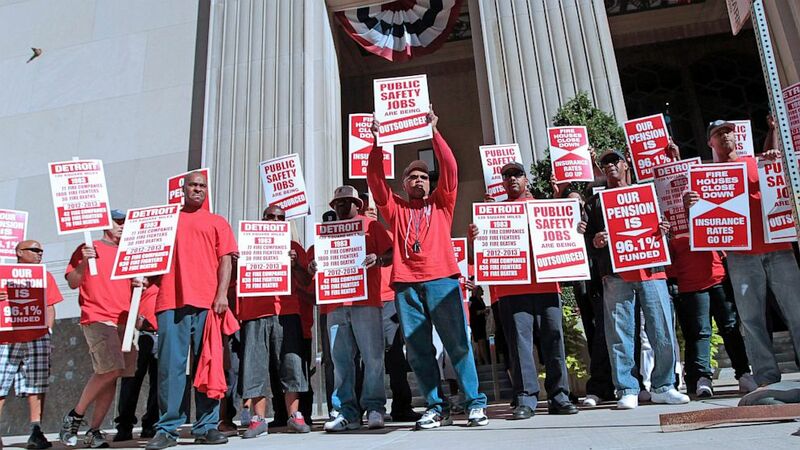 Can the Capitalist Rebuild Detroit Amid the Ongoing Economic Crisis? 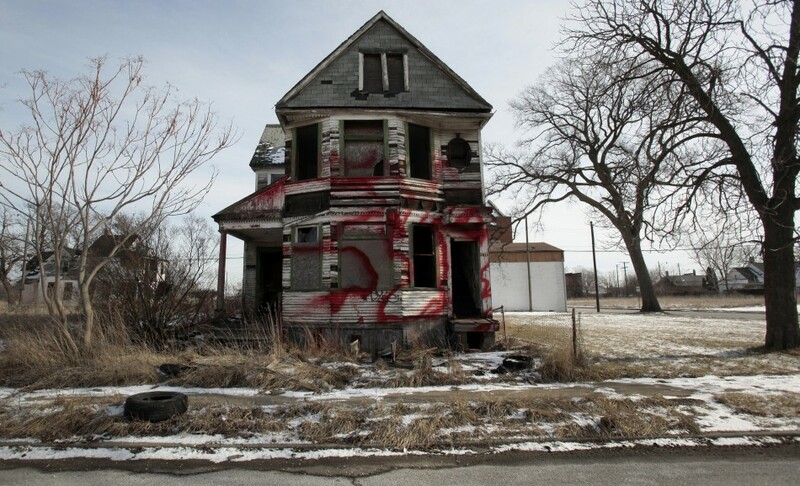 Even though the ruling class is saying that they will reconstruct the city of Detroit in their own image, it remains to be seen whether the investment capital is actually available to make a significant dent in reversing the blight and underdevelopment. A key element of the development plan for the city is centered on the construction of a new hockey arena and entertainment district by Illitch Holdings. In addition, the building of a light rail system on Woodward Ave. from downtown through Midtown to the New Center area is taking place as well. However, similar efforts during the late 1990s and early 2000s with the opening of two stadiums and three casino hotels failed miserably as it relates to ensuring financial stability. Anywhere between 60,000-150,000 tax foreclosures could take place by the spring of 2015. Unemployment within the Detroit and the surrounding region of southeast Michigan remains high. The only real jobs being created are in the low-wage category that lack benefits and stability. Since the financial crisis of 2007-2009 and the bailing out of the banks, insurance firms and auto companies, the corporations have failed to reinvest their trillions of dollars of capital in job creation and infrastructural improvements since such efforts would not guarantee the rate of profits that these entities are seeking. The phasing out of Quantitative Easing (QE) could prompt rises in interest rates and further stall growth spurring a renewed decline in the overall economy. Of course when these plans fail to create the desired results, the ruling class and their agents in government will initiate a new round of austerity measures through lay-offs, the further driving down of wages and therefore creating additional hardships for the majority African American working class in Detroit. Only a program of development that empowers the working people can provide any realistic hope of improving the conditions of the people. Any shift in policy that could benefit working people will only be the result of mass struggle and anti-capitalist organization. Consequently, the only real solutions to the problems facing the people of Detroit will out of necessity emerge through a direct challenge to the banks demanding a payback of the billions they have expropriated from the people through seizures of homes, jobs, pension benefits and public assets. Next articleIn The Media – Is Every Black Man A Criminal? I would not be against bailing out of the banks, insurance firms and auto companies if that money was in fact able to trickle down to the rest of us. But as well all know, trickle down economics is a failed metric. Nothing good ever trickles down in this age. I haven’t heard the last time people talked about manna coming from heaven. That was a different age. Now, you can’t expect to benefit from any company. Their walls are air-tight and nothing good is transmitted to the general public. So for that reason, bailing out big corporations is not the way to help the majority of people. Right now it seems Detroit is being sold left and right to the highest bidder without regard for what stake black or Latino people have in their place of residence. The protesters have a right to be concerned with their city being a place where corporations seem to have more rights than citizens. This is sad, men stooping this low, even in Africa society! The cat is out of the sack. Detroit has always been coveted by white Americans who want to make it back into the city. That is why Detriot has been run the way it has, so the people living there now can go bankrupt and lose their homes. The city will be cleaned out, off Black people, in Whites! That has always been the most underlying fact. I big fat shame for a country that calls itself progressive. What shall it profit a man to gain the whole wide world but lose his soul? Detroit can go to the people who want it so bad but God will punish them – God will visit punishment upon the iniquities of their children, grandchildren and children’s children’s children! That is also a fact. The chickens have again come home to roost – this is all 1% the trickery of the elite white politicians and the bedfellow capitalists in Detroit, and 99% the lack of organization on the part of African Americans to have seen this coming more than a decade ago. That is a shame too!